Menestra is one of the irreplaceable dishes of Navarra cuisine. Menestra can be served as a side dish to fish or meat, or as a main course in its own. In this recipe, use only the stems of the Swiss chard. Cut away the greens and save them for making a Sautéed Swiss Chard with Raisins and pine nuts. You will be using three pots simultaneously because the vegetables must be cooked separately, but the result more than justifies a crowded stove top. If using preserved asparagus, drain them and reserve 1 cup of the brine; set the asparagus and brine aside separately. If using fresh asparagus, cut off about 1 inch from the base of each spear and then peel the spears with a vegetable peeler. Pour 1 quart of the water into a saucepan and bring to a boil over hight heat. Salt the water lightly and add the Swiss chard stems, beans, and, if you are using them, the fresh asparagus. Cook for 20 minutes, or until the asparagus are tender, then lift the asparagus out with a wire skimmer or tongs. Continue cooking the chard stems and beans for 10 minutes longer, or until very tender. Drain, reserving 1 cup of the cooking liquid, and set aside to cool. When cool enough to handle, cut the chard stems and the beans into thin strips. Meanwhile, working with 1 artichoke at a time, peel off the tough outer leaves. Cut off the stem flush with the bottom, and cut off the top one-third of the leaves. Rub the trimmed artichoke with a lemon half. Repeat with the remaining artichokes, rubbing them each with the same lemon half. In a second saucepan, bring 1 quart of the water to a boil over medium-high heat. Add 1 tablespoon of the flour and the remaining lemon half and stir to mix. (The lemon prevents the artichokes from turning dark, and the flour counterbalances the acidity of the lemon and makes the artichokes more tender.) Add the artichokes, decrease the heat to medium, cover, and cook for 20 minutes, or until tender when pierced with the tip of a knife. Drain. In a third saucepan, bring the remaining 1 quart water to a boil over medium-high heat. Salt the water lightly, add the peas, decrease the heat to medium-low, and boil gently for about 5 minutes, or until tender. Drain. 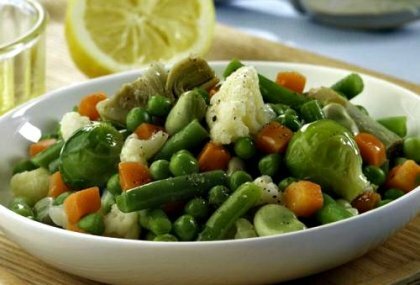 Put the vegetables in separate piles on an oven proof platter and place in the oven. Meanwhile, in a small skillet, heat the olive oil over medium heat. Add the ham and sauté, stirring often, for 1 minute, or until the fat glistens. Using a slotted spoon, lift the ham from the pan with the oil to high heat and stir in the remaining teaspoon flour. Add the reserved 1 cup brine (or the cooking liquid if you used fresh asparagus), stirring to mix well, and bring to a boil. Cook, stirring often, for about 2 minutes, or until the liquid turns opaque. Pour the sauce over the vegetables, heat through in the oven for 2 minutes, and serve immediately.